Audi's flagship SUV is now available with two new V6 engines in Europe. 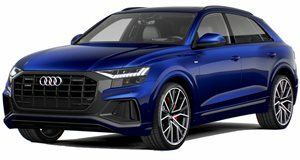 The first model added to the updated Q8 range is the 55 TFSI gasoline model, which packs a turbocharged 3.0-liter V6 that produces 335 hp and 369 lb-ft of torque. Audi claims this setup enables the flagship SUV to hit 0-62 mph in 5.9 seconds before reaching an electronically limited top speed of 155 mph. The other new addition is a variant of the existing 3.0-liter diesel V6. Dubbed the 45 TDI, it produces 228 hp and 369 lb-ft of torque that’s offered between 1,750 rpm and 3,250 rpm. 0-62 mph takes 7.1 seconds, while top speed is quoted at 144 mph. All engines in the new Audi Q8 range are combined with a mild hybrid system that can reduce fuel consumption by up to 0.7 liters per 62 miles.